I know in past posts I have referred to "Philadelphia Style Ice Cream" which I was under the impression was ice cream made without a custard (egg) base. Thank you for your inquiry. Actually, what makes the vanilla "Philadelphia-style" is the vanilla bean specks in the ice cream, so both our vanilla and French vanilla (made with egg yolks) are "Philadelphia-style" ice creams. 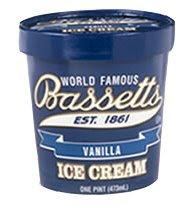 If you are unsure about a flavor, you can check out our ingredients on the Flavors page of our web site--Bassetts Ice Cream - Since 1861. Hm. This is not what I thought. In fact, I had never heard of anything of the sort. I checked out the ingredient list [Cream, Milk, Sugar, Corn Syrup, Chocolate Chips (Sugar, Chocolate Liquor, Cocoa Butter, Soy Lecithin,Vanilla), Nonfat Milk, Green Coloring (F. D. & C. Yellow No. 5, F. D. & C. Green No. 3), Guar Gum, Xanthan Gum, Carrageenan, Soy Lecithin, Oil of Peppermint] there were no eggs to speak of, but I still felt shakey on the definition of "Philadelphia Style" I had always known. This is our All Natural line of ice cream. This ice cream is made with cream, milk, sugar and all natural flavors. Philadelphia Style is just the name that was chosen for this line. 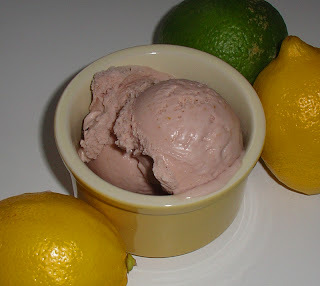 Traditionally, Philadelphia style ice creams are milk and cream-based mixtures which contain no eggs. This means the ice cream is less rich, but it has a more intense flavor. The style is also known for using pure, natural ingredients and some Philadelphia Style ice cream mixtures are also cooked before they are frozen. Of course, all of this is in contrast to “French Style” ice cream which uses eggs and is sometimes also referred to as a custard. Well, at least Ernie is on my side! Thanks, Ernie! I began to think about where I got this initial impression, and it turns out that our favorite ice cream author Bruce Weinstein distinguishes eggless ice cream as "Philadelphia Style". On the first page of his Introduction in The Ultimate Ice Cream Book, Weinstein writes "There are two basic styles of ice cream in this book: custard style ice cream (some times called "frozen custard," "French ice cream," or "gelato"), which is made with eggs; and Philadelphia-style ice cream, which is made without eggs." Well there it is folks. Weinstein's book being a favorite, and somewhat of a bible, and in fact only the second ice cream book purchase, I learned early on this definition of "Philadelphia Style." 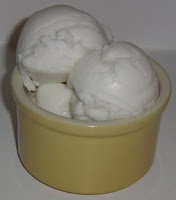 Philadelphia ice cream--ice cream containing only cream, sugar and flavoring; also, vanilla ice cream flavored with visible vanilla seeds or crushed vanilla pods. Whew. So I am still not quite sure of the exact definition. Damerow seems to kind of combine both Weinstein and Turkey Hill's definition with that of Bassett's. This makes me a little reassured but also a little weary, since Bassett's so directly told me their "Philadelphia Style" has egg yolks and I am under the impression that Bassett's is the defining ice cream of Philadelphia. I'm interested in your opinion. What defines "Philadelphia Style" to you? Would especially love to hear from you Philadelphian's! On another note, as I was looking for some specific ice cream images, I came across this beautiful water color on PaperandThreads Blog that I just had to share. Lovely work! There is just something so wonderful in its simplicity, as in much of this artist's work. I hope he/she doesn't mind my sharing! 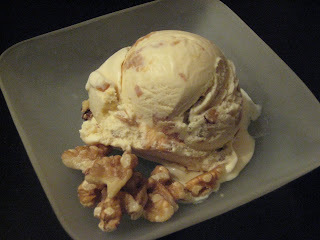 It's been a few months since I embarked on this ice cream making escapade and its also been three long months of being requested to make Maple Walnut ice cream. Since winter is almost over (finally!) and it will be time for some light and refreshing flavors, I thought I'd honor the request and break out the 100% Vermont maple syrup. The final batch was a light amber color with a smooth and delicate maple flavor. Overall it was pretty easy to make. I ended up adding extra maple syrup right before freezing for more flavor. Bake walnuts at 350 for 10 minutes until fragrant. Chop and put aside. Cook the maple syrup over medium heat to reduce to 3/4 cup. Whisk together egg yolks, salt, and reduced maple syrup. In a heavy saucepan cook the cream and half & half over medium heat until almost simmering. Slowly whisk this heated cream mixture into the egg/maple mix. Return this mix to a saucepan and cook over med-low heatm stirring consistently with a rubber spatula until the mixture lightly coats the spatula. Coll over an ice bath and chill overnight. Freeze according to your machine's instructions and fold in toasted walnuts before freezing. Freeze for at least 8 hours. Forget the hot dogs, make it an ice cream block party! Oh the signs of summer are not far now...flowers blooming, grills going, playgrounds bustling, and good old neighborhood block parties around every corner. While some of us dread the 'get to know the neigbors' events there are many who need just one more excuse to gather the Jones and Smiths. I would dare to bet that no matter what camp you live in, if there's endless ice cream you may have to think twice about skipping this shindig. For the fourth year, Edy's Ice Cream, is giving 1,500 people a scoopin' good time, an ice cream block party for up to 100 people in their neighborhood. So if its an excuse you need to meet the cute neighbor or to get to the bottom of who stole your trash cans, search no more. Nominate your neighborhood today. Ten Ice Cream Birthday Clubs -- Complete with Free Treats! 2. It's not too difficult to make. I made a chocolate base and added a bag of crushed Mini Oreos when it was almost done freezing. Cold Stone Creamery. National, all ages. Sign up with a Cold Stone account and you can add up to five family members. Within seven days of your birthday, (seven days prior and seven days after) sign into your account and print a coupon for a free Creation™. Coupon must be used during those fourteen days. Baskin Robbins. National, all ages. Sign up to receive a free 2.5 oz scoop on your birthday. There are no FAQs about this club, so all I can tell is that you can add additional family members. I am not sure how long you have to use the coupon, because I have yet to celebrate with Baskin Robbins, but I imagine it is similar to that of Cold Stone. Friendly's. East Coast locations, all ages. This site doesn't have too much information, but says "You'll get the chance to sign up for the Friendly's Birthday Club -- and you'll receive a special e-offer two weeks before your birthday." One thing to note is if you sign up within fourteen days of your birthday, you may not get the offer until your next birthday, so go ahead and sign up today! Brighams. Massachusetts and New Hampshire, for kids up to 12 only. Kids get a birthday card along with a free kid's meal and kid's sundae. Glacier Homemade Ice Cream. Colorado and California, all ages. Sign up to receive a free ice cream cone or small gelato. Carousel's Ice Cream. Maryland, all ages. Carousel's "will send you a special birthday gift for your birthday." Belfonte Ice Cream. Missouri, all ages. Sign up to be eligible to receive a free half gallon of Belfonte ice cream. (With six proofs of purchase you can also send away for a free ice cream scoop. You can get started on collecting the UPCs with your free ice cream!) Sounds like this ice cream is only found in the Kansas City area. Marble Slab Creamery. USA, Canada, and Middle Eastern locations, for kids up to 12 only. Free child size ice cream cone with mixin. Ed and Eddie's Homemade Ice Cream. Tampa, Florida, up to age 15. Good for a single scoop. "Pass" is good for 10 days. Kirsch's Ice Cream. Massapequa, New York, all ages. Sign up to receive a free gift on your birthday. "If your birthday occurs this month or next month, please mention you are new to the birthday club when you visit us in-store on your birthday." And, don't forget the pooch! Frostbite Ice Cream. National mail order, all ages. Coupons for a free doggy cone and $3.00 off a doggy ice cream cake. Though the concept is pretty neat, this site was hard to navigate and had a flash site that was slow to load and had annoying noises...My patience wore and so I wasn't exactly sure where to get the ice cream, though I do know they are headquartered in Boston. Frosty Paws. Found nationally in grocer's freezers, all ages. Birthday card and coupons for doggy treats. Of course, this is just a sampling of places to get spoiled on your birthday...perhaps in the future I'll have a part two of more local places that have birthday clubs, but in the meantime, with a number of national scoop shops with birthday clubs, you are bound to have plenty of ice cream on your birthday! Illustration by Bethany Schlegel. © 2008. Coming from a household that cooks a pound of bacon weekly(I can proudly say I am not consuming it..most of the time that is! ), this of course caught my attention. Candied Bacon Ice cream from our favorite ice cream maker and author, David Lebovitz, is ice cream innovation at its best but is it surpisingly scoopalicious?! 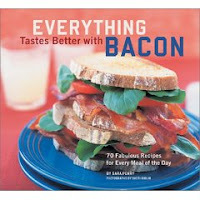 It really is amazing what one can do with this oh so bad piece, but yummy, piece of pork. Who would have thought to add it to ice cream. I can't claim to have tried it yet but I do plan to make it since I have a feeling others in my home will love it. I'll be sure to share our findings but in the meantime enjoy and checkout Everything Tastes Better with Bacon for some main courses before tempting your guests with the bacon ice cream. Have you experimented with fun and innovative additions to your ice cream? We'd love to hear about it. Let us know your crazy flavor finds. A couple of weeks ago I found a recipe for Shirley Temple Cupcakes (this was a great recipe, but you have to dig a little further to the Rootbeer Float Recipe to get cooking times/temps...) As a HUGE fan of Shirley Temples (probably the most common of the mocktails) I went and made them right away. What a treat! Combine the first five ingredients plus 1/4 cup of grenadine in the top half of your double boiler. Place over simmering water and heat, while beating contantly, until the mixture thickens. This took me about 17 minutes. Allow the mixture to cool slightly, and add the lemon extract, the milk, the cream, and the other 1/4 cup of grenadine. Cover and refrigerate overnight. Place the chilled mixture in your ice cream maker and freeze according to the ice cream maker manufacturer's directions. Enjoy! Thoughts? This ice cream was good and creamy, and had a tart taste that was quite refreshing. It reminded me of lemonade pie that my former roommate and I used to make. However, the overwhelming taste was lemon, and no matter how much grenadine I tried to add, it just didn't seem to balance the lemon. The other thing I noticed is that even after freezing the ice cream overnight, this didn't harden as much as other recipes I made. My plan for the next batch is to try balancing the flavor a bit more and adding maraschino cherries. It might add some nice texture and a bit more of that Shirley Temple feel. Big thanks to Stef over at Cupcake Project for her inspiration and homemade grenadine recipe! A small ice cream shop, Lizzy & the Enchanted Creamery, is tucked away in the corner of a small strip mall in Cumberland RI. A rather hidden and local gem. Two young woman, one with a passion for ice cream(thatta girl) and the other children's books, put their minds together and opened this unique shop... half homemade ice cream and half books & toys. The fun part is there is a stage and play area in the back where they offer story time or kids can go to dress up and just use their imagination. I still wonder how they survive with what I would consider not the greatest location, but they do and after having the peppermint ice cream I can see why. So every Friday I plan to bring my little one to storytime but never make it. It's this last Friday that I plan to have girl's night out with her and realize its not a normal night at Lizzy's as camera crews hover and people overflow out the door. Come to find out ABC's hit show, Extreme Makeover: Home Edition, is in town and are holding a fundraiser for the family and the best part is that it will be part of the episode(so look for us in the back, it airs in May!). So we crowd into the tiny stage area where the show's designers read a special book about the selfless act of fostering children. The family whose house they were rebuilding foster children and were going to be taken away due to high levels of lead in their home so the book was very appropriate. It truly is a show with a heart so if you haven't gotten sucked into reality TV like me this one isn't so bad. So with a book read, cameras rolling, and kids screaming it was time for ice cream. With utter chaos surrounding me, it was hard to pick from their many unique flavors so I stuck with my tried and true peppermint. It was deliciously creamy and refreshing. I let me little one choose her own and she of course went straight for the blue ice cream. Interestingly enough the flavor of it was creamsicle. Not what I expected and with each bite it just seemed odd(yes, I think I ate more than her!). Although very good, the color was throwing me off. Amazing how the looks of something can change how it tastes. So what turned out to be a simple night for storytime was rather exciting and best of all we got some yummy ice cream. I'll be sure to revisit and come back with more reviews of the flavors. There were too many to choose from and all homemade. Check 'em out if you're ever in northern RI. So I have been drawing lot of sweets lately and I really wanted to draw ice cream. 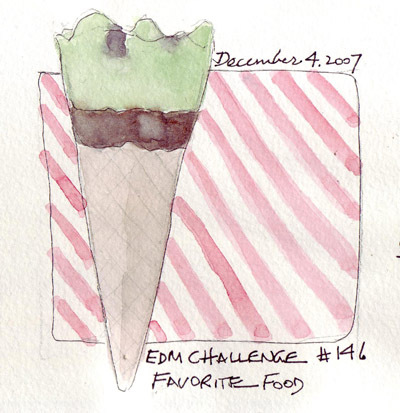 My couple of attempts at drawing ice cream bars were frustrating and quite frankly the images were pretty boring. (There is very little texture to ice cream bars and pudding pops.) What I wanted was the fantastic airy texture of a scoop of ice cream. In standing mixer (Kitchen Aid) or food processor, blend corn syrup and shortening until smooth. Gradually beat in powdered sugar until stiff dough forms (this is basically a stiff frosting). Knead in remaining sugar (as needed to reach desired consistency) on a cleansurface. Store in heavy resealable plastic bag; keeps well in refrigerator. Freeze for longer storage.